VW Up! Lite revealed | What Car? This is the 116mpg four-seater concept car that Volkswagen revealed at the Los Angeles motor show today and it's going to be built. It is the fifth offering in VW's Up! family of show cars previously it has shown three- and five-door models plus as well as for fuel-cell and electric versions. This one is called Up! Lite because its aluminium, high-strength steel and carbonfibre three-door shell helps trim its weight to just 695kg. The Up! 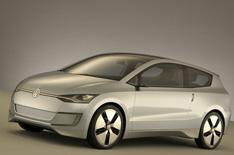 is due to go into production as a sub-Polo front-wheel-drive city car with conventional petrol and diesel engines towards the end of 2011. The Up! Lite adds another powertrain option to the mix full hybrid. It is powered by a 51bhp two-cylinder 0.8-litre turbodiesel engine with stop-start capability linked to a 10kW (13bhp) electric motor, all driving through a seven-speed DSG semi-auto transmission. By pushing an Eco, button the driver can trim the power of the diesel engine to 36bhp, giving the car its 116mpg capability, with CO2 emissions of just 65g/km. The electric power system, called a pulse start module, is cleverly integrated on the driveshaft between the engine and gearbox. It acts as a starter for the TDI engine, as an alternator to generate electrical power (which is recharged under braking) and as an aid to the diesel when extra acceleration is needed. It can even drive the car on its own for about a mile-and-a-half when coasting or running slowly in town. Up! Lite is not just an urban runabout, though. VW claims 0-60mph acceleration in 12 seconds, a top speed of 100mph, and a potential range of 500 miles, despite a tiny weight-saving fuel tank that can store less than five gallons. Aerodynamics also play a big part in the car's economy. The Scirocco-influenced styling makes the car relatively long at 3.84 metres, and it is also low. It features totally flush windows and 'active thermal management' flaps that close off the radiator when maximum cooling air is not needed to reduce drag. The drag coefficient is 0.237, better than the 0.24 of the current best production car, the Mercedes-Benz E-Class coupe. The number of controls has been kept to a minimum to support the 'climb in, buckle up and drive away' philosophy that harks back to the original Beetle. It is not short of comforts, though. Display screens act as control panels as well as information displays and 'passive park ventilation' lets out hot air on sunny days to avoid needing the air-con, which uses a lot of energy. There's space for four people, easy-entry front seats and an easy-fold rear bench, and a full set of safety systems, including stability control. VW says Up! Lite is 'a technically challenging car... that might be launched globally', adding that 'most of the components are based on those of the new small family (Up!)'. Our sources say that it will be made, if not in this form exactly, then as something very close.